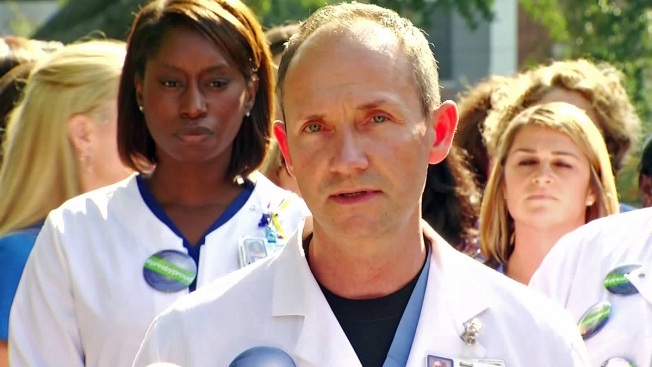 Dallas Nurses: "This Could Happen to Any Hospital"
Presbyterian Nurses: "This Could Happen to Any Hospital"
Top nurses at the Dallas hospital where two nurses fell ill treating the nation's first Ebola patient spoke out for the first time Monday, affirming their pride in their hospital amid scrutiny and vowing to reaffirm the public's trust. "The reason we're here today is to make sure people know that Texas Health Presbyterian Hospital is still a great hospital, an excellent hospital," chief nursing officer Cole Edmonson said at a brief news conference in front of the hospital Monday afternoon, flanked by nurses he called part of a "proud family." "We're proud to tell people that we work here," he added. "We will reaffirm your trust in Presbyterian." "We are experts in our field, and we don't want to be judged by this one incident," emergency department nurse Julie Boling said, overcome by emotion. "This could happen to any hospital." The nurses gave their well-wishes to their two coworkers who remain hospitalized in isolation for Ebola, after they contracted the disease treating Thomas Eric Duncan, the first person diagnosed in the U.S. He died Oct. 8. Amber Vinson is being treated at Emory University Hospital in Atlanta, the same hospital where Fort Worth's Dr. Kent Brantly and American aid worker Nancy Writebol were successfully treated, and her coworker Nina Pham is being treated at the National Institutes of Health in Maryland. On Monday, health officials' efforts to contain Ebola's spread cleared a key hurdle when four dozen people were being cleared from the watch list.